In 1968, rock promoter Bill Graham launched the Fillmore East in New York City and the Fillmore West in San Francisco, changing music forever. For three years, every major rock band played the Fillmores, performing legendary shows: Jimi Hendrix, the Grateful Dead, Santana, Jefferson Airplane, Led Zeppelin, Cream, the Allman Brothers, and many more. 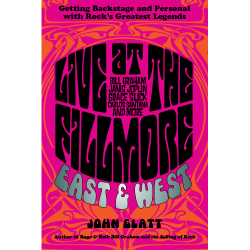 Author John Glatt tells the story of the Fillmores through the lives of Bill Graham, Janis Joplin, Grace Slick, Carlos Santana, and an all-star supporting cast. Joplin opened the Fillmore East and delivered some of her greatest performances there and at its San Francisco twin. Carlos Santana grew up as a performer at the Fillmore West after being discovered by Graham on audition night. Always unpredictable, Grace Slick’s electrifying Jefferson Airplane was the de facto resident band at both Fillmores. Chronicling the East and West Coast cultures of the late ’60s and early ’70s—New York City with its speed, heroin, and the Velvet Underground versus San Francisco with the LSD-drenched Summer of Love—Glatt reveals how Graham the made it all possible . . . that is, until August 1969 when Woodstock changed everything and musicians suddenly realized their power. But why did Bill Graham shutter both Fillmores within weeks of each other in 1971, during the height of their popularity? Live at the Fillmore East and West reveals how Graham’s claim that “The flowers wilted and the scene changed,” was not quite the whole story.